Our current popular cultural trends approach music primarily as a form of entertainment and enjoyment. The faster the beat and the more outrageous the words, the more listeners seem to be entertained and enjoy their musical experience. Yet somehow with the loudest sounds there also comes a great hollowness in the human soul. The Muslim listener rightly asks what the relationship is between his or her faith and music. It seems that these days the two most common responses to the question of Islam and music tend towards the extremes. One side sees only the misuses of music and rejects it completely. The other approves of any sort of music as long as it is branded ‘Halal’, as if Islamic phrases can simply be copy-pasted over the music of the day, whatever its form. Yet the reverberations of centuries of diverse musical traditions that we hear today from around the Islamic world lead us down another path, in a quest to understand music that is authentically Islamic. This search is no simple venture. It requires that we both forge a profound connection with the musical traditions that have been passed down to us and open our souls to the deeper mysteries of the heart. The center of the Islamic soundscape is undoubtedly the recitation of the Qur’an, which while not being considered ‘music’ is undeniably musical. Along with the adhan, the rhythms and cadences of the Qur’an have left an indelible imprint on the souls of Muslims throughout the centuries, deeply influencing musical traditions as well as the poetry that is sung to this music. The Qur’an reverberates audibly in many musical genres, from songs of praise to the Prophet and recitations of du‘a to the traditions of chanted dhikr in Sufi khanqahs and zawiyas. However, the diverse traditions from Morocco to Indonesia and South Africa to the Central Asia show us that it is not necessary for music to be recognizably Qur’anic in its outward form for it to be Islamic. Traditional Islamic music encompasses a multiplicity of sounds and influences as diverse as Arabic Muwashshah and Qasida, Qawwali and Kafi from the Indian subcontinent, the Persian dastgah system, the Turkic maqam musics, and numerous folk traditions. Yet despite this diversity, all Islamic music reflects the One. The diverse types of traditional Islamic music breathe in an ambience that is tawhidi, constantly reminding us of God’s Oneness and bringing us back to the harmonious state of the fitrah in which we were all created. Though the intensity of the presence of the sacred in different forms of Islamic music varies, it is always present, like an all-pervading fragrance of paradise. And this is true even if there is no explicit mention of religious themes, as we see in so many Islamic folk traditions in which the passionate yearning of a lover raises the beloved to near-divine proportions, giving a reminder of the Divine and of the nature of true love to those of us who know how to listen. The spirit and outlook of traditional Islamic music are embedded within the notes themselves, in scales that exploit the vast expressive possibilities of microtonality, using notes not used in Western music. Found in innumerable permutations across traditions, and even differing among masters of a single tradition, the melodic frameworks of traditional Islamic music allow for the communication of an infinite variety of human emotions and spiritual attitudes. Yet even more important than the notes themselves are the ways in which their understanding is passed down from master to disciple. Education in traditional Islamic music is permeated by the presence of a certain etiquette, or what we often hear in Islamic parlance as adab. The concept of adab has various dimensions: it can refer to the manner one sings, plays an instrument, and communicates with the audience, one’s way of showing humility and reverence towards elders, or even the intention to revere God and His Messenger. Adab beautifies our outward behavior, and by doing so, our inward substance. Music, or indeed any work of art, when practiced with adab, is not only a matter of performance and the entertainment of an audience, but a method of educating one’s self and the individual souls of the audience members. In this sense music shares a great deal with the practice of dhikr, the repetition of the Divine Names and Qur’anic formulas in spiritual practice. The repetition of certain words, the way one breathes, and even one’s dress while chanting are all significant, imprinting and ingraining moral qualities on the practitioner’s soul, as do the way one holds an instrument, the notes that are played, and the inner attitude of the musician. The goal is not so much a passing state of the soul as a permanent transformation in its very substance. The human voice and the instruments of Islamic music are treated as a trust, an amanah, in the hands of the singer who has gone through years of training at the feet of a master, who also instructs him or her in purifying the self (nafs) and proper Islamic etiquette, passing on scales and melodies crafted by masters who lived in times much more deeply imbued with the Sacred than the world we live in today. When learned in this way, from heart to heart and with proper reverence, the inner world of the disciple is literally transformed by the music, becoming a vessel for centuries of expression and contemplation, yet also being able to manifest the spirit of this music using the unique gifts that God has given that musician, in the moment and space that he or she has been placed. The spirit of tawhid, the cultivation of adab, and the inner return to the fitrah are all missing from non-traditional music and represent much of what is most valuable and must be preserved within Islamic musical traditions. We live in a world in which music is so often used as a means to manipulate the emotions or to provide a means of escape from the troubles of daily life. Traditional Islamic music also contains profound emotional content, perhaps experienced most profoundly in traditions of love poetry set to music, yet the emotions are directed to a higher purpose, as the intensity of love is raised to such heights that we realize it is only the Infinite Beloved that can be its true object. Rather than escapism, Islamic music is fundamentally a means of remembrance, of the limitless Peace or the passionate Love of the Real. In this way, whereas nearly all contemporary music, classical or popular, is horizontal, bringing forth interminable benign or even harmful emotional responses in the soul, traditional Islamic music is vertical. It is like the sacred alif of the Divine Name, discussed at great length for centuries by Muslim mystics and philosophers alike. It points us towards the transcendent, towards the Life beyond this life, and inculcates in us the yearning for the Beloved from whom we have been separated. And sometimes it even lifts us in celestial ascent towards the Beloved Himself. In many ways, the qualities of Islamic music that we have been discussing are common to all Islamic arts: imbued with the spirit of the Qur’an, passed on through traditions of cultivation of the soul from master to disciple, and crafted to bring us back to the remembrance of God. Yet Islamic music possesses another characteristic that distinguishes it from arts such as the architecture of the mosque or the recitation of the Qur’an, and which is deeply significant for the world we live in today. Islamic music has a unique power to speak to all members of humanity, regardless of faith. The wisdom of Islamic music springs from and speaks to a wordless harmony that is found in the depths of the souls of all people, the fitrah itself. Because of this common harmony, Islamic music has always absorbed those pre-Islamic musical traditions that were in conformity with its deeper spirit, be it in Persia or Indonesia. The integrity of the transmission of Islamic musical traditions and the living presence of masters who embody the values of these traditions make Islamic music an outstanding representative of the values of spiritual cultivation, the remembrance of the transcendent, and the ability to live in harmony with our environment. These are values that humanity cannot bear to live without in a world that is growing ever more disharmonious and forgetful of its Origin. My own musical journey, the gradual deepening of awareness of what makes our music truly Islamic, has been nothing short of a journey of growth and cultivation personally. I have tried my best to inculcate my humble work with the qualities described above to the best of my understanding and ability at each stage in my quest. But more importantly, it has been my intention to remind my listeners of these elements, to help them also to value the thought and reflection that goes into creating a work that carries within it that resonant Qur’anic spirit. It is undoubtedly an ongoing journey of discovery and a great distance remains to be traversed. Much more work remains to be done, both academically and artistically — an endeavor I hope is taken seriously if we wish to preserve our heritage and deepen our art for the present and future generations. Young Muslims of today need to have humility when entering this field if they are truly eager to call their music ‘Islamic’. They must understand that the sincere apprenticeship to our traditions and the assimilation of their spirit must come before innovation and da’wah (proselytizing), no matter how good the intentions may be. Truth must never be mixed with error, for all this will do is create the tribulations of fitnah and confusion. Being a “Halal” ‘alternative’ to the latest pop sensation does not qualify music as being Islamic. This trend of distorting our traditions to suit the passing fancies of the times can only lead to a loss of not only what has been passed down to us but also our sense of who we really are. Authentic Islamic music is not and cannot be indifferent to either its own form or its content. It is fully conscious of its Origin and Source, which is the Truth, the One and only Reality, Allah. Whether this awareness is reflected in explicit terms that are drawn from the Qur’an or drawn in other dimensions of our human existence, it remains graceful and dignified; the form of the music itself reflects the harmonious inner spirit of its message. The intention is for the listener and the composer to be drawn back to the depths of their own being, at the heart of which is the sacred presence of the All-Compassionate. Islamic music neither settles for frivolous lyrics that corrode our minds nor empty beats that only stimulate our impulses rather than our deeper thirst for joy and for life. Music is a gift sent from heaven as a sacred trust to remind us of the Truth. Let us continue as our forefathers did in absorbing the wisdom, knowledge and unbelievable repertoire passed onto us and, with humility, ‘innovating’ with the musician’s unique God-given voice. Only then will what we create be a unique and yet nonetheless authentic and Islamic music, which ultimately brings about the remembrance of Allah — the Centre of all. 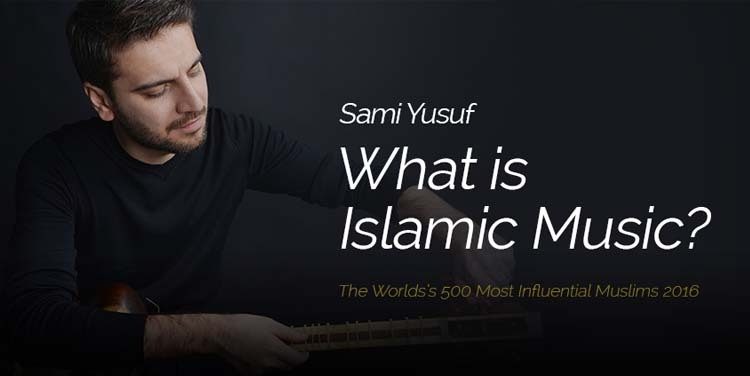 Sami Yusuf is a world famous British singer-songwriter, composer, and producer.